Mott The Hoople recorded seven studio albums and one live album in the period 1969-1974. Since then any number of compilation albums have appeared, varying from the highly desirable to the disappointing. 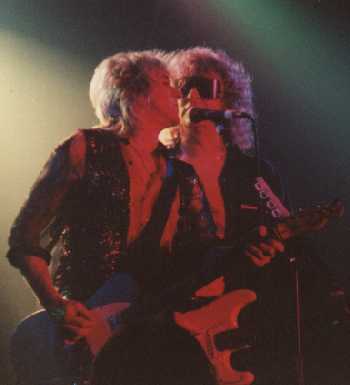 Since leaving Mott The Hoople, Ian Hunter has recorded fourteen studio albums, with five live albums also having been released. There are also a few Ian Hunter compilations available, several of which include Mott The Hoople material. In the discography, I have listed every Mott The Hoople album, Ian Hunter album, Mick Ronson album, Mott album, British Lions album and other albums by members of the Mott The Hoople family, together with all the Mott The Hoople singles, Ian Hunter singles, Mott singles and British Lions singles that I know of. I have also listed every British Lions track, every Ian Hunter track, every (solo) Mick Ronson track, every Mott The Hoople track and every MOTT track, so if you're after just one or two specific tracks you'll know where to find them. I have also listed all known DVDs and Videos. In addition, I have listed all the bootlegs that I know of. This is presented for historical purposes, as these days nobody should be buying bootlegs when you can download them for free (thus effectively putting the bootleggers out of business). Note that all the desirable Mott The Hoople bootlegs have in any case been released commercially (so buy the official releases!) In that vein, I have listed all the commercially-available live recordings by British Lions, Ian Hunter, Mott The Hoople and MOTT (so there should be no excuse for sharing something that's been officially released). For the casual music fan wishing to dip his toe in the water, the best introduction to Mott The Hoople is the 2003 CD Mojo Presents.... It's ten times better than London To Memphis or Super Hits. If you wish to delve into the pre-Bowie Island era, either Best Of...The Island Years or Backsliding Fearlessly are worthy compilations. If you wish to start sampling Ian Hunter's solo output, bear in mind he's still working and making albums, so compilations are unlikely to include his latest work. The best compilation is 2000's Once Bitten Twice Shy. Ignore compilations that purport to be the "best of" (such as The Best of Ian Hunter and The Very Best Of Ian Hunter) as they most definitely are not "the best of" Ian. Compilations are a great way to get started, but what of the original albums themselves? Well, to guide the purchaser I've now written a Buyer's Guide (inspired by the column of the same name in Classic Rock magazine), for both Ian Hunter and Mott The Hoople. The opinion of the fans themselves, as revealed in our 1996 poll results, is also available (although bear in mind that post-1996 releases aren't covered). Please don't ask where to get specific albums, and especially not bootlegs - I simply don't know! Try Amazon for currently-available titles, or eBay for out-of-print items. No one should be buying bootlegs these days - for unofficial recordings (eg of recent gigs) try one of the reputable file-sharing sites like Dimeadozen or Trader's Den. Copyright © 1996-2019 Adrian Perkins. Hunter/Ronson photo copyright © Wolfgang Gurster.